Long before disposable diapers, people used cloth. My mom used traditional cloth diapers (the kind you had to fold and secure with pins!) on me. She washed them at home, and reused them time after time. My husband's mom used a similar product for all three of her children, through a cloth diaper service, where she was able to use the diapers, return them to a service, and receive clean cloths in exchange. However, times have changed. Cloth diapering services are no longer available in my town (believe me, I looked! ), and the once popular pin-secured, folded diapers are completely out of style. Even still, Clinton and I decided long before Lucas was born, that we wanted to try cloth diapering. People looked at us like we were absolutely crazy! Everyone I talked to told me that it wouldn't last, and that I'd be converting to disposable diapers in no time flat. Yet still, after weeks of research, I confidently purchased a cloth diapering baby bundle, convinced that I would persevere, and that Lucas would have what his father and I had: a soft bum covered in comfortable cloth, rather than papery, plasticy, diapers. When Clinton and I decided to use cloth, we chose the gDiapers system. 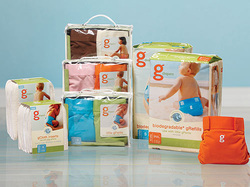 gDiapers is an earth and user friendly hybrid diapering system that utilizes an outer underwear-like diaper, with a choice of disposable and cloth inserts. With as many diapers as I've changed in my life (which believe you me, is a LOT! ), I still had a lot to learn when it came to changing Lucas. I picked up a lot of tips and tricks along the way, some of which worked, and a lot which didn't. 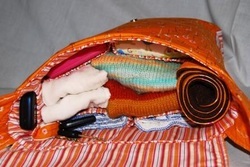 Cloth diapering may seem impractical, because does take some patience and effort, as well as some extra laundry. But using cloth diapers at home and while you're out doesn't have to be intimidating! If you have the right knowledge and gear, it's as easy as pie!